On 16 October 2018, assist. 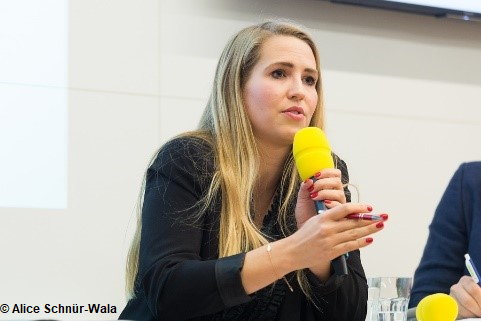 Nina Pejič, a Junior Researcher at the Centre of International Relations, Faculty of Social Sciences, University of Ljubljana (CIR), participated in a discussion hosted by the Austrian Society for European Politics (Österreichische Gesellschaft für Europapolitik) in the Haus der Europäischen Union in Vienna, Austria. At the event, researchers from Austria, Hungary, Slovakia, Czech Republic, and Slovenia discussed the current state of populism in their respective countries, using current data from a survey carried out in the aforementioned countries with financial support from the Europe for Citizens Programme in the European Union. Assist. Pejič presented the recent survey results for Slovenia (also available here), whereby the national survey interpretation was prepared by prof. dr. Maja Bučar and dr. Marko Lovec, Assistant Professor (both from CIR). Other panel speakers included Christian Kvorning Lassen (EUROPEUM – Institute for European Policy, Prague, Czech Republic), Daniel Milo (GLOBSEC Policy Institute, Bratislava, Slovakia), András Szalai (Center for European Neighborhood Studies, Central European University, Budapest, Hungary) and Paul Schmidt (Austrian Society for European Politics, Vienna, Austria), while the panel was moderated by dr. Vedran Džihić (Österreichisches Institut für Internationale Politik). The final public discussion within the project co-funded by the Europe for Citizens Programme will take place in Brussels on 24 October 2018. The invitation is available here.